Bone tissue is constantly being remodeled and repaired by the body. Various disorders can damage bones and result in bone lesions. 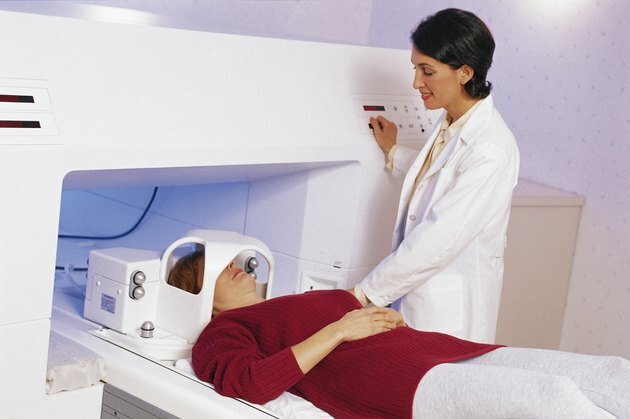 Symptoms include bone pain or tenderness, and the injury can only be seen using special imaging tests. Bone lesions are abnormal areas of bone typically identified using an X-ray or MRI. Lucent bone lesions, the Department of Radiology at the University of Washington explains, are caused by rapidly progressing bone injuries. Sclerotic lesions are bone injuries that develop more slowly, which allows the bone to attempt to wall off the damaged bone tissue. Bone lesions typically have cancerous and non-cancerous causes, notes the Merck Manuals Online Medical Library. Cancerous bone lesions can be due to primary bone cancer or as a result of metastases from cancer elsewhere in the body; noncancerous lesions can be due to infection or inflammation of the bone, or may be due to benign bone tumors. The cause of a bone lesion is typically diagnosed using a bone biopsy, according to MedlinePlus. With this procedure, a small section of bone is removed using a long needle. This bone sample is then analyzed to determine the underlying cause of the bone injury. What Are the Causes of Lytic Bone Lesions?